For he did great wrong and maintan'd little right." 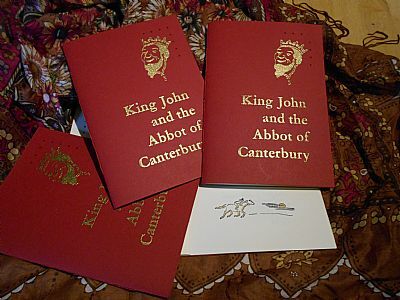 "King John and the Abbot of Canterbury" is a poem by an anonymous writer, taken from "Percy's Relics"*, but the date of it is also unknown. The poem is illustrated by Frances Grant, and for the first time we have ventured into two and three colour illustrations printed from relief blocks which we have manufactured ourselves - it's taken a long long time! Letterpress printed in several colours. limited edition of 30 copies. A5 format. * ‘Percy’s Reliques’ were a collection of ancient documents hoarded by the Earl - and unfortunately not well preserved. One story mentions that a maid was using them to light the fire! This poem was one of the documents eventually ‘rescued’.